Baking and decorating shaped cookies is my latest obsession. 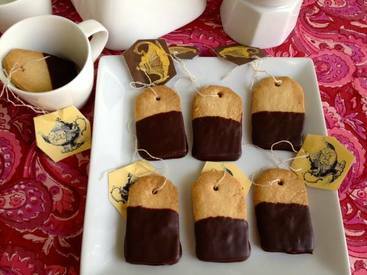 The tea-bag cookies featured here were inspired by a picture I came across on Pinterest. I was surprised at how easy it was to prepare them! After making the cookie dough, roll out 1/4 inch thick and cut out using a tea bag as a guide. With the help of a skewer make a tiny hole at the top of the cookie so that once its baked and cooled, you can tie a string through it. Chill for 10 minutes in the refrigerator and bake. Shortbread cookies when allowed to chill before baking, get a nice sharp edge . Cool and dip into tempered dark chocolate. It’s a quick, no fuss cookie that are just way too cute!